In 2018 it is unlikely that you will ditch all your bad habits in month one. Why? 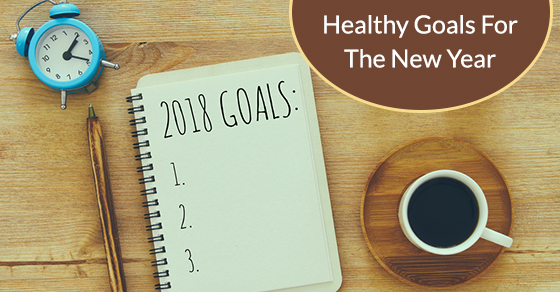 Because 2018 is about setting small and manageable goals that have a greater long term impact toward a lifestyle change. These goals may appear simple and even too easy, but when put into practice, they can reset bad habits, boost energy, help you lose weight, and feel your best for the entire year. Discover the top nine health goals for the new year. First, Ditch the Diet Diets typically don’t work. Making short-term changes to your eating habits will not reap long-term benefits. Participating in restrictive dieting is more likely to encourage binge eating and eventual weight gain. Weight cycling can also lead to adverse health effects. Choosing to take on long-term eating changes in your diet will be more likely to show positive results down the line. Try to avoid restrictive dieting in 2018. Eat More, But Eat Clean Instead of trying to eat less in 2018, try to eat more. Eat more dark leafy greens, more fibrous fruits, more lentils and beans, more fiber, more calcium, more protein, more iron, and so on. Don’t finish a meal with the question, “did I eat too much?” finish it with “did I eat enough nutrients?”. This dramatic shift in your thinking will allow you to see your plate differently. This isn’t to say you should eat more empty calories or more fast-foods. Eating more should be about eating the foods that nourish and energize you throughout your day. Drop the Sugar Addiction Are you addicted to sugar? Most Americans consume approximately 94 grams of added sugar a day. The recommended intake is around 50 grams a day (for someone on a 2000 calorie diet). Cutting down on the amount of processed or refined sugars in your diet will bring nothing but benefits. After several days without processed sugar, the natural sweetness of fruits will become a treat to your taste buds. You may find yourself with more energy, less cravings, and even weight loss. Are you sleeping 7-9 hours a night? Most people dip below their recommended nightly rest and can have serious symptoms as a result. Not only does sleep deprivation cause you to be moody and foggy, it can also drive you to sickness with a weakened immune system, it can lead to high blood pressure, weight gain, and lower brain function. In fact, a review of 16 separate studies found that those who sleep less than 6-8 hours a night increase the risk of early death by about 12 percent. Sleep is seriously important. Try to get more shut eye by cutting down phone time before bed, skipping the TV shows to unwind early, and even set an alarm notifying you when to hit the pillow. Make going to bed earlier a part of your new routine and feel energized instantly. Wake Up Earlier Establishing a morning routine can change your entire year. Challenge yourself to wake up one hour earlier than you normally do. Rolling out of bed and heading straight to work can leave you feeling lethargic and sleepy throughout the day. Waking up early to make an adequate breakfast, stretch, or meditate can improve your entire day. If you want to really challenge yourself, aim to get in a workout before you start your to-do list for the day. A morning workout boosts your energy levels in a more sustainable way than that espresso shot. Meditate for Five Minutes a Day You’ve probably heard a lot about mindfulness lately. If you’re new to meditating, start with five minutes every morning. We can spend hours scrolling through our phones and yet five minutes sitting quietly can feel painful at first. Set a timer and sit in an upright position in a chair or on the floor. Be mindful of your breathing and count each deep breath until you reach ten. Start again at one. When thoughts come into your head simply watch them come and go and let them pass. Slowly extend the amount of time you meditate weekly. Meditative practices cultivate a greater sense of awareness in your everyday life and allow you to calm neurotic thoughts and let go of negative thinking patterns. The end result is a healthier mind and greater well-being. Don’t believe us? Try it. A study recently released by Deloitte found that Americans check their smartphones upwards of 8 billion times per day collectively. That’s an aggregate number that refers to the number of times all Americans throughout the country look at their mobile devices on a daily basis, stemming from the average number of each American checking their phone 46 times a day. That’s a lot of phone time, and potentially a lot of wasted time. This year get the app Moment to track your phone usage. See how many times you pick up your phone in a day, which apps occupy the most of your time, and how to set daily goals to cut down on phone usage. Swapping phone time for a healthier activity could change 2018 for the better. Hydrate All Day People don’t often forget to have their morning cup of coffee, and yet water consumption can fall by the wayside. Make an active effort in the new year to fill a large water bottle, keep it close by, and finish 11.5 cups a day (for women) and 15.5 cups a day (for men). Drinking water can help flush out waste, regulate your body temperature, lubricate joints, and more. Sometimes we may feel hungry when our body is actually thirsty for water. Drink a cup of water before every meal and snack to ensure you don’t overeat. Make Workouts Fun A large deterrent to working out, is often the overcrowded gym in the month of January. If you’re forcing yourself to get up and run a few miles, but hate running, this can end up being a short-lived aspiration. This year, try a new activity or workout that is designed to be healthy yet fun. A kickboxing class, a yoga studio, a daily swim, a zumba dance, skipping as cardio, or biking through a beautiful park. Finding a workout you’re excited to participate in will make staying fit so much easier in 2018. Live Your Best Life, A Healthy Life 2018 is your year of self-care and self-love. Take care of your physical and mental health by applying these simple habits to your life. When you find yourself falling into old, unwanted habits, tell yourself that just this one time you’re going to try things differently. Try to workout before work and see how you feel. Try to meditate, try to sleep 8 hours one night, and try to drink 3 litres of water a day. When you give these changes a try you'll realize how amazing you feel and not want to give them up.